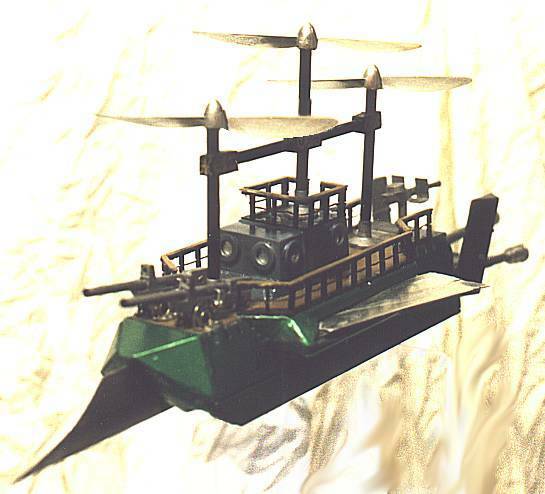 BALACLAVA is a large model of a small aeronef-style flying machine of the type described by George Griffith, Jules Verne, and other period authors. 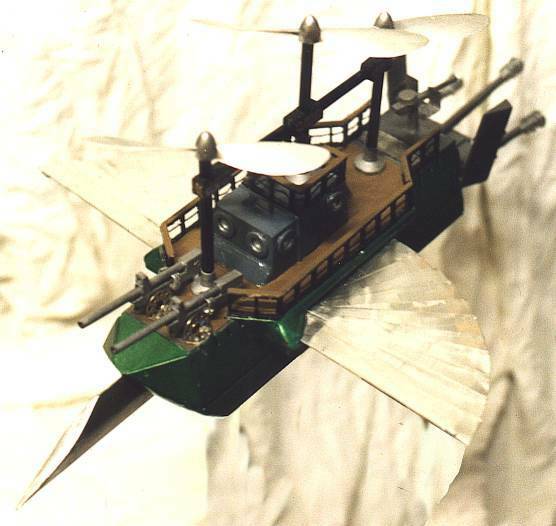 She's designed to be used with 25mm gaming figures, and is about 19" long (including a forward ram and rear propeller shafts and steering gear), 8" high, and 4.5" wide excluding wings. 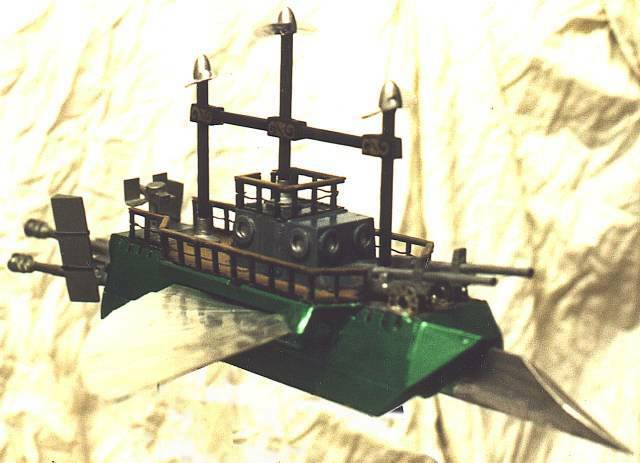 The main hull is 11" long. The wings are folding and extend to a span of 14". In scale terms she would be about 114 ft long, with the main hull 66 ft and 27 ft wide. She would be 48 ft high from the base of her triple keel to the top of her masts. Balaclava is built mostly out of junk. Components include parts from an old scanner, various plastic boxes, plastic tubing (mostly old pens), thick aluminium foil from disposable serving trays, and pieces of the casing of video tapes and floppy discs. The top propellers were designed for small flying model aircraft, and were the only parts purchased ready-made for the model. There's also a lot of epoxy modelling putty and filler in there. I was aiming for a Victorian high-tech feel, also for a look as unlike a conventional helicopter or aircraft as possible. For this reason the rear screws are helical (made from cavity wall fixings) and the top screws are conventional propellers, not rotor blades. I originally intended to make the top screws as helical spirals too, but my modelling skills weren't up to making them look convincing. The wings fold in numerous sections, like fans, and are made of hard aluminium foil, bent double as a series of nesting > shapes, from 3" to 5" long and 3/4" wide, hinging on pivots towards the front of the ship. Internal threads link the sections so that when the outer section is pulled out from the hull it pulls the next, which pulls the next, etc. I haven't attempted to model the hydraulics etc. that would be needed to make this work in the real world. The two pictures below show how to make the wings. 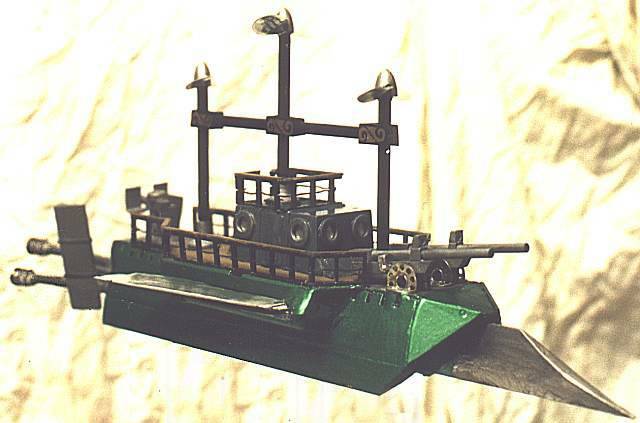 As of 29/10/02 the ship is largely built, but detailing isn't very good and some parts will probably be remodelled. I hope to have her on display and in use for scenarios at the Dragonmeet games convention in London on 30th October 2002.